Whether you’re a die-hard fan or just want to watch the commercials, almost everyone loves to watch the Big Game each year (at least, 110 million people do). But instead of sitting at home, eating store-bought chips and guacamole, why not try something new? At FIX, we’ve got you covered. 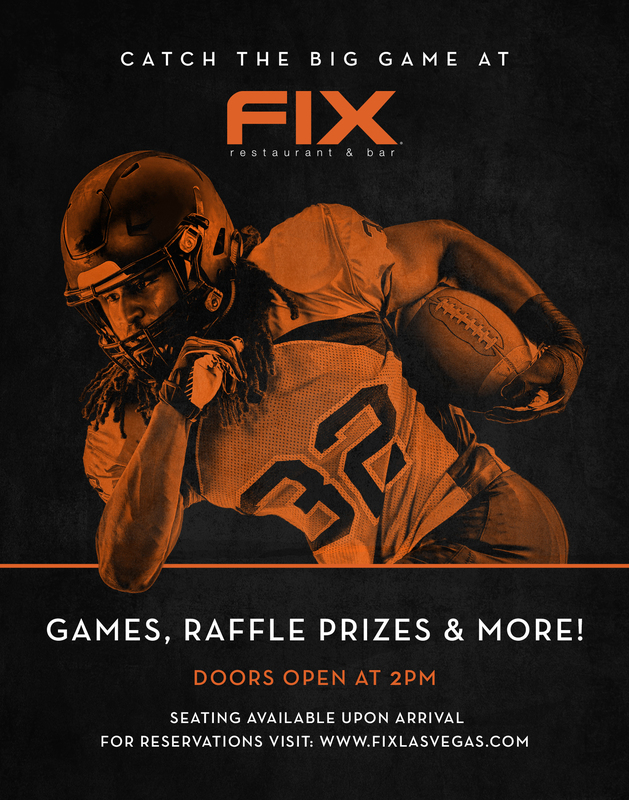 We’re showing everyone’s favorite football game in-house, and serving up Game Day specials FIX-style. We’ll have endless Buffalo Wings, Lobster Tacos, Sliders, Mac & Cheese Bites, Chili Dogs, and more at your fingertips, with more than enough drinks to go around. And to keep things interesting between plays, we’ve got plenty of raffle prizes sponsored by Absolut, Don Julio, Jack Daniel’s, Bud Light and Heineken to give away! In order to save a prime seat for the action, be sure to make a reservation and arrive early. As one of our most fun events of the year, seats will be limited and may fill up fast. Make your reservation by calling us at (702) 693-8400, and we’ll see you there! Similarly, getting a ticket to the Big Game could run you upwards of $6500! Three teams have been to the Big Game eight times – can you guess which ones^? This special Sunday is the second largest food consumption day in America, right behind Thanksgiving.